This post is a sponsored conversation made possible through The Women Bloggers in association with Kendal King Group and #SoapboxInfluence. All opinions are my own. There's something about hummus that sounds expensive. But, it doesn't have to be. Hummus does not have to be a luxury item in your grocery cart. In fact, with Bush's Hummus Made Easy, it can be the most inexpensive item in your cart -- also, the most tasty! With baby carrots, pita chips, or sliced cucumbers, you'll be snacking on hummus every chance you get. Have I mentioned how easy it is to make this hummus at home?? Grab your food processor, drain and rinse the beans, empty the packet of hummus flavor, and process until smooth. Done. The finished product is two cups of fresh, delicious hummus made easy. 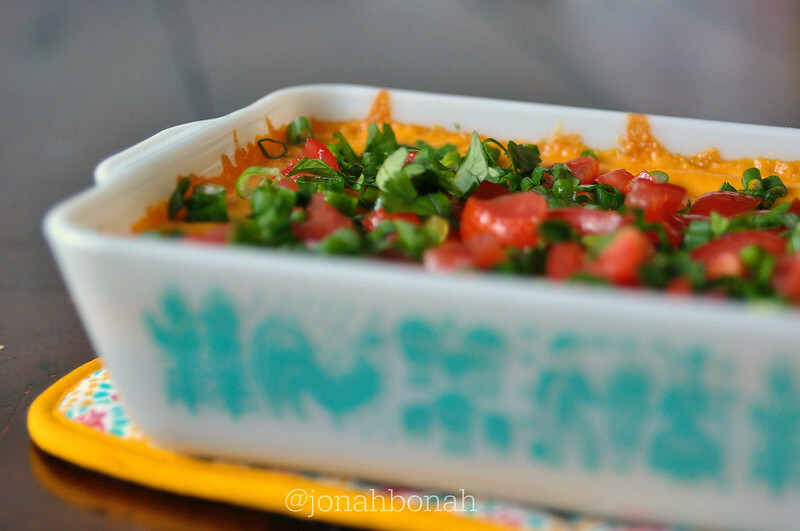 Today, I'm sharing with you a recipe that is a favorite at every party I take it to. There's never even a teaspoons worth of this delicious dip leftover in the dish at the party's end. 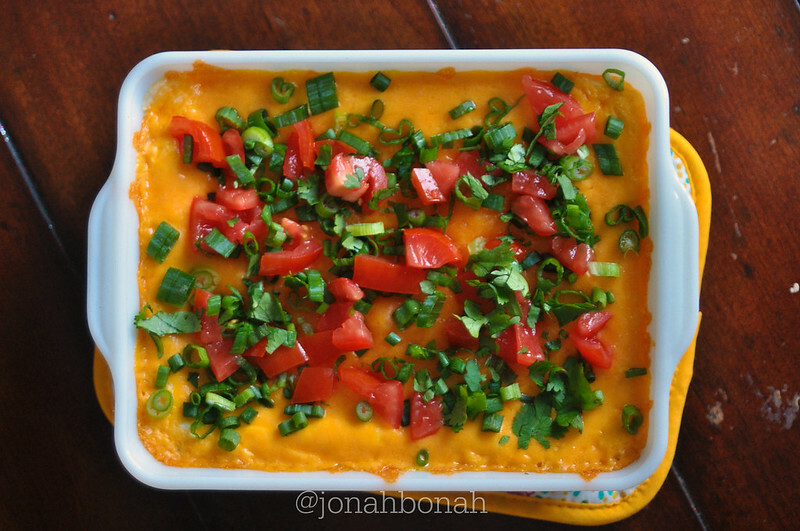 The original recipe uses refried beans in place of the hummus. But, I tweaked it a little to have Bush's Hummus Made Easy, the Southwest Black Bean flavor, substitute the refried beans and taco seasoning. The end result is, dare I say it, even more tasty than the original recipe! Preheat oven to 350°F. Prepare Bush's Hummus Made Easy per package directions. Combine pressed garlic into prepared hummus. Spread hummus over bottom of oven-safe baking dish. Combine cream cheese and sour cream; mix well. Spread cream cheese mixture over hummus. Bake 15–18 minutes or until hot. Remove baking dish from oven to cooling rack; top with cheddar cheese. Return to oven and bake an additional 2–3 minutes or until cheddar cheese is melted. Meanwhile, slice tomato in half lengthwise; scrape out seeds. Dice tomato and thinly slice onions. Snip cilantro. Sprinkle olives, tomato, onions and cilantro over dip. Garnish with additional sour cream and serve with tortilla chips, if desired. 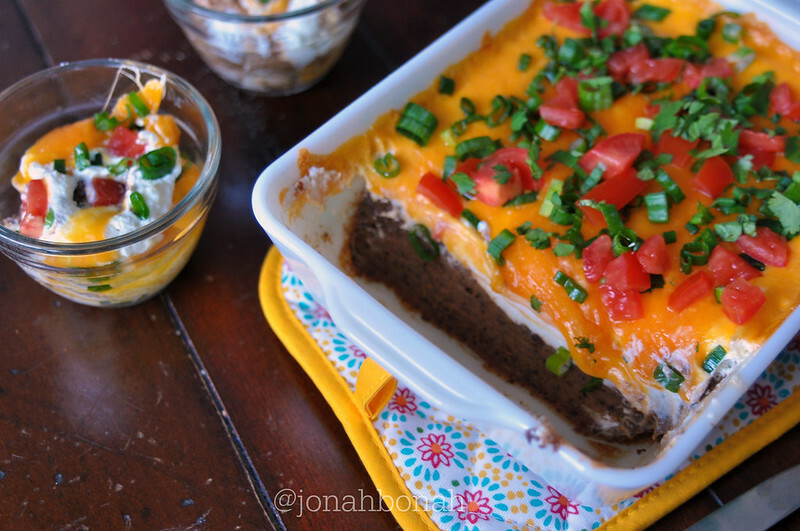 Watch as your Southwest Hummus Black Bean Dip disappears into your friend's bellies. With two other flavor choices in Bush's Hummus Made Easy, the recipe and snacking possibilities are endless. Choose from Classic, Southwest Black Bean, or Roasted Red Pepper. Find it in the "bean" aisle. 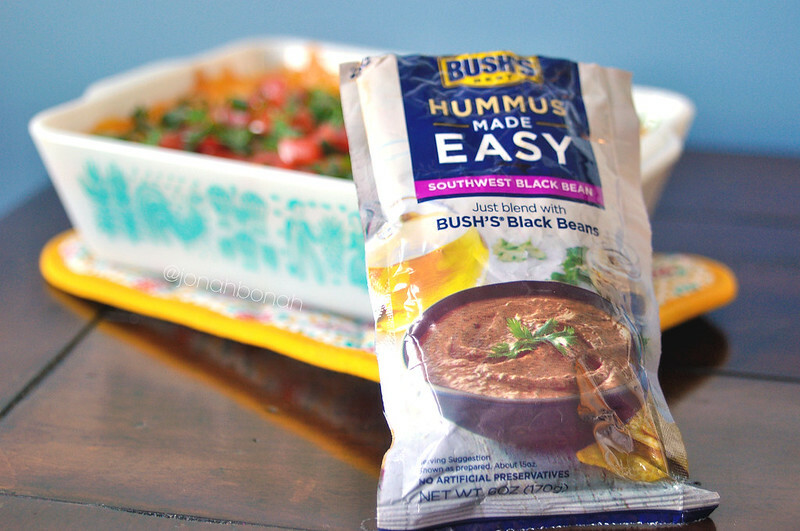 How will YOU use Bush's Hummus Made Easy? I'd love to hear which recipe you'd recreate using one of these hummus flavors! Tell me in the comments. Looks so colorful and delicious! What a great idea! I would use hummus in my roasted veggie sandwich with melted provolone! I love hummus and these flavor packets make it so easy! I love Bush's beans, this recipe looks so delicious! This looks super delicious! Ill be making this over the weekend, thank you. I'm always looking for new recipe ideas! This looks delicious!